The first British women to walk across Antarctica to the South Pole have arrived safely, more than two months after starting their record-breaking journey. Catherine Hartley said she was "absolutely elated" to have completed the trek, which saw her nine-strong group cover 680 miles (1,094 km) while withstanding temperatures as low as -48C. Fellow walkers Fiona Thornewill and her husband Mike won another record by becoming the first married couple to achieve the feat. The expedition left London on 21 October 1999 for Punta Arenas in southern Chile, flying on to Patriot Hills near the Antarctic coast. Ms Hartley admitted she found the trek very difficult, and had been afraid she might be forced to drop out because of the harsh weather. Speaking from the South Pole, the 34-year-old said: "I am absolutely elated because the journey was a real struggle for me." "I had to fight every inch of the way to get here and there were times when I honestly didn't think I was going to make it." "To be here is absolutely thrilling and quite unbelievable." Ms Hartley said her motive for undertaking the expedition was a "driving force of adventure". "Antarctica is one of the last unexplored wildernesses," she added. Ms Hartley, a floor manager at the BBC, and Mrs Thornewill, a 33-year-old recruitment consultant, underwent a rigorous training programme in the months preceding the trek. This included running while dragging tyres behind them, in preparation for the 200lb (90.7kg) sledges used to carry their supplies. The group had originally hoped to reach the South Pole before the New Year but bad weather delayed the start of the trek by a few days. Later that month another record was broken as a group of five British women became the first all-female expedition to reach both the North and South poles. 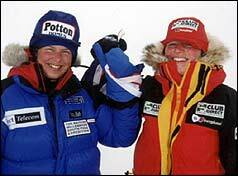 The women were personally congratulated by Prince Charles by satellite phone after reaching the South Pole at around 0600 GMT on 24 January 2000. Temperatures at the South Pole can be as low as -75C, with winds of up to 80mph (129kmh). Antarctica is the coldest and fifth largest continent - twice as big as Australia. Visitors face crevasses up to 100ft (30.4m) deep and snow dunes up to 10ft (3.04m) high.